more info HI all! We just had this conversation today about Cho Cho's. Being from Reading,PA we had them in the cup, with a stick...you had to roll the cup in your hand then pull the Cho Cho from the cup. Just like a popsicle. MMMM, and our group is a bit younger...in our early 40s. I'll have to tell everyone that Schells is the closest thing to it. Do they ship at all? I really could use one now after all this talk! more info I have been looking for Cho Chos forever, or so it seems. My earliest memory is of my waiting on our large front porch for the horse's hoof beats and the bell of the the wagon he was pulling for Muhlenberg Dairy. The slower his beats, the hotter the afternoon. It was the early 50s and I was about 3 or 4. My aunt would be working in the house listening for me to joyfully call the arrival! The gentleman driving the wagon would ring the bell three times knowing I would make it to the curb by then. I was always holding my money, just a few cents I am sure, which I had gotten ready just after lunch. The driver would stop the wagon, help me cross the not very busy avenue and wait for my order, Inevitably it was for a cho cho! I would thank him and hear him say "See you tomorrow, same time." He then helped me cross back to my side of the avenue while waving to my aunt. My hands couldn't wait to encircle the small cup, pull it off, and start eating that Cho Cho. There it was: the delicious, refreshing snack. There is none better to this day. I now live about 40 miles north of Reading, PA and get back often to visit relatives. About 20 years ago I could always go directly to Muhlenberg dairy and by the Cho Chos by the cases. But alas, the dairy closed. My next definite stop will be Schell's! Thanks for all the great memories. more info I was born in Reading, PA in 1935, same year as Elvis. I ate cho chos in the '40s. The cho chos made by Muhlenberg Dairy did not taste like the original cho chos. Muhlenberg Dairy is now out of business. The cho cho's sold today by Shell's Dairy Swirl in Temple do not taste like the original cho cho's of the '40's & 50's. Everybody I talk to agrees with me. I live just a few miles from Shell's in Temple, PA. The cho cho's are not a big seller today and not at all popular or famous like back in the old days. I would not waste my money for shipping costs to buy Shell's cho cho's at 70 cents each. more info I have had a craving for Cho-Cho Pops since I last had them around 1960. There has been NO ice cream since that time that is comparable and particularly in the summer, I miss them like crazy. Currently I live in CA, but in the 50's I lived in a small upstate NY town that had them in a private 5&10cent store whose name I cannot recall. But I DO remember right where these bars were and the tiny floor freezer they were housed in. What a great memory. I'll be trying the recipe to see how close it comes. The next closest thing was frozen custard. I'm thrilled to see all the posts about this. For some reason, I always thought they were a local thing in NY, but now I know many more people share my fondness for these treats. Sharon W.
more info If you ate a cho cho in 1960, you did not have the original cho cho. 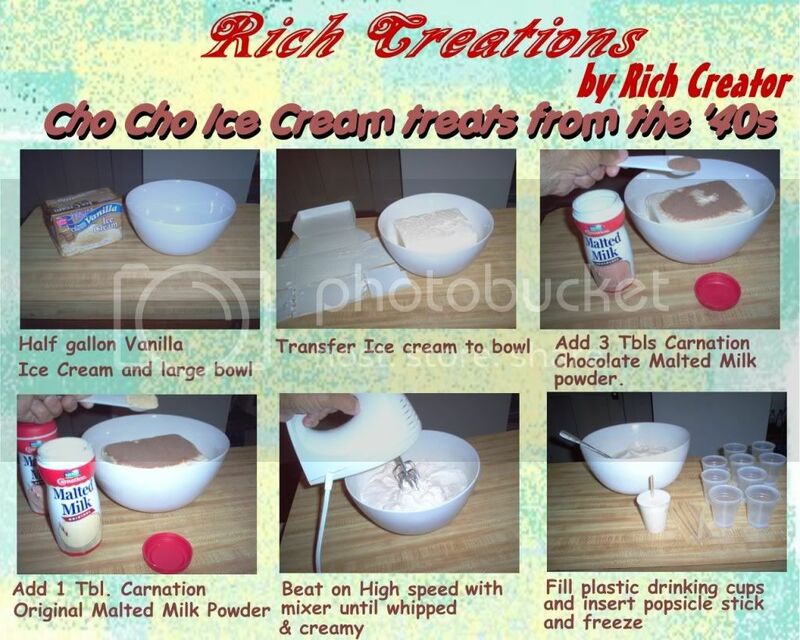 None of the cho cho imitations are like the real thing. Cho cho is about the taste, first and foremost. But, it seems, all the imitations think the cho cho is about the size and shape. more info Let's ALL remember that if we had the Original, it wouldn't taste the same. After age 50 our TASTE BUDS DIE OFF in great numbers.Let's be satisfied with a close facsimile. more info I'll have to try this recipe. Really, what can it hurt. My three teenagers will eat anything I put in front of them. Since they have never had an original Cho Cho, they will not know the difference. So, if I don't like the way they taste, I don't have to worry about them going to waste. more info Cho-Cho pops were my favorite when I was growing up in Brooklyn, New York in the 50's. I e-mailed foodtimeline.org and asked if they had any information on Cho-Cho pops[with the crunch]and they e-mailed me the following.... According to the records of the U.S. Patent and Trademark Office[http://www.uspto.gov]Cho-Cho ice cream novelties were introduced by the Carnation Company June 6, 1939. The trademark was reassigned to the Popsicle Company in 1982. The brand/product expired in 2003. ORIGINAL RECORD HERE: Word Mark CHO-CHO Goods and Services [CANCELLED] IC 030. US 046. G & S: Ice Cream. FIRST USE IN COMMERCE: 19390605 Mark Drawing Code  WORDS, LETTERS, AND/OR NUMBERS IN STYLIZED FORM Design Search Code Serial Number 71420448 Filing Date June 13, 1939 Current Filing Basis 1A Original Filing Basis 1A Registration Number 0378236 Registration date June 4, 1940. Owner[REGISTRANT] Carnation Company CORPORATION DELAWARE 100 West 10th Street Wilmington DELAWARE. [LAST LISTED OWNER] Popsicle Industries, Inc. UNKNOWN ENGELWOOD, NEW JERSEY Assignment Recorded Type of Mark TRADEMARK Register PRINCIPAL Renewal 2ND RENEWAL 19800604 Live/Dead Indicator DEAD Cancellation Date June 22, 2001 [This is exactly how the information was e-mailed to me. I am not sure if this information helps in the quest?] The e-mail goes on, for another 20 lines, with the words from an ad in the Los Angeles Times, April 28, 1940 [p.G3]. The e-mail NOTES: This ad[in the L.A. Times]contains ILLUSTRATIONS of the product and copy of a coupon. The e-mail[from foodtimeline.org]lastly states- "Many people recall this particular frozen treat with fondness. Some memories here: www.dianasdesserts.com/website/forum/viewmessages.cfm?Forum=6&Topic=32" This is how I found this forum. After reading every post I decided to post the e-mail from foodtimeline in the hopes that it would somehow help. P.S. Sorry for the length of this but I wanted to include everything that was e-mailed to me. more info Wow now this is info in depth.......So I guess the search goes on.thanks for the info.."POPSICLE" GET YOUR BUTTS IN GEAR AND MAKE THEM AGAIN...JUST REMEMBER " MAKE IT AND THEY WILL COME"
This is Diana from this website. I am looking for a recipe for as I call them "Cho Cho Bars". I had them when I was a child in the 50's. I remember having them at school where they would sell ice cream in small individual sizes like Eskimo Pies, and Ice Cream Sanwiches, etc. These Cho Cho's were a malted flavor ice cream or ice milk that came on a stick and the Cho Cho's were circular. They were wrapped in paper (no plastic wrap back then), and you would roll the Cho Cho in the palms of your hands to soften the ice cream, so you could remove the paper and eat the ice cream. If anyone remembers these, please let me know, and if anyone has a recipe for them, or a "Malted Flavor Ice Cream", or frozen dessert, I'd really appreciate you sharing it with me. Ok, Diana, you now have a recipe for a cho cho closest to the original than any other so-called cho cho on the market. You have my permission to include it in your recipes.